Yes, folks! 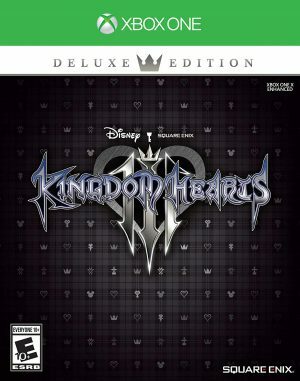 The long, LONG wait for Kingdom Hearts III has finally come to an end as the beloved Disney/Final Fantasy title has arrived on gamers’ doorsteps as of January 29, 2019! Kingdom Hearts III acts as the end of Sora’s main tale and for many of us, finally ends our pains of having to wait for nearly 15 years since Kingdom Hearts II. Now our job here at Honey’s Anime is to answer one of the scariest but most necessary questions in all of Kingdom Hearts III. 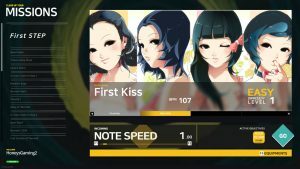 Was the wait for this third entry worth it? Find out our answer as you read the full review of Kingdom Hearts 3 down below! Kingdom Hearts III brings players back into the role of Sora as he continues his battle against the forces of darkness. Players will embark on a new journey that has Sora and his comrades going through various Disney worlds like Frozen, Pirates of the Caribbean and even Toy Story to name a few. Unlock new skills and battle with new friends and against new threats. Owners of the Xbox One will also be able to play Kingdom Hearts III as it’s available on both PS4 and Xbox One! Sora has not only failed the Mark of Mastery test but has begun to lose his powers he’s gained over the years. 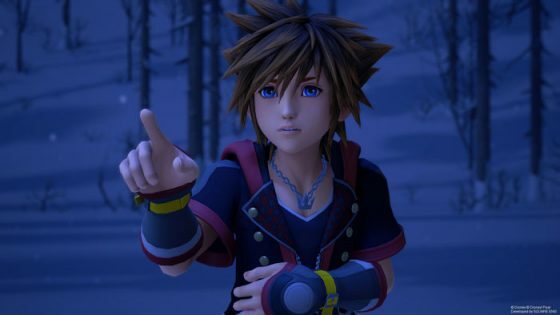 Yen Sid tells Sora though that against the powers of darkness, he will need to be at his top to even hope to stand alongside his friends and battle those who wish to do harm to the world. Sora, Donald and Goofy decide to visit an old friend who once knew the pains of losing his power but was able to regain it. The battle against darkness prevails, but can Sora and his allies hold back this new approaching wave? Sora’s journey comes to a closure in Kingdom Hearts III! 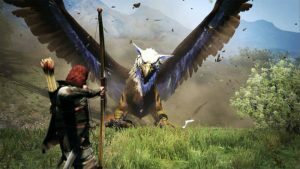 Waiting for good Square Enix games—especially Final Fantasy titles—has made us here at Honey’s Anime patient beyond definition. It’s why, despite having spin offs, remasters and even cell phone games, that we didn’t breakdown as we watched Kingdom Hearts III continuously be pushed towards a later release date. At one time, we honestly wondered if Kingdom Hearts III would even be released. However, we were happy that finally we held Kingdom Hearts III in our hands for both the Xbox One—which is where this review focuses on—and the PS4. Does Kingdom Hearts III merit the painfully long release? We shall find out in our review of Kingdom Hearts III for the Xbox One! In case you’re completely new to Kingdom Hearts, we will sum up the base story and setting. Players assume the role of a young teen named Sora as he becomes a Keyblade holder and must use his powers of light to destroy the evil that is darkness. Sora has faced numerous enemies along the way growing as both a human and a warrior at the same time, but after the events of Kingdom Hearts: Dream Drop Distance, Sora has lost nearly all of his powers. Kingdom Hearts III focuses on Sora and his allies going on a grand journey to regain Sora’s powers before the epic battle with darkness resumes once more. 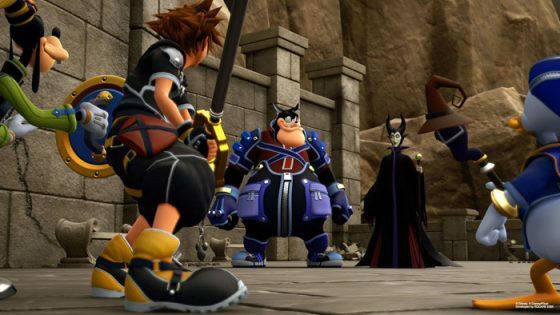 There’s a lot more to Kingdom Hearts’ story—such as Organization XIII and various other baddies—but if you’re new to the series, there is a semi-informative recap within Kingdom Hearts III. 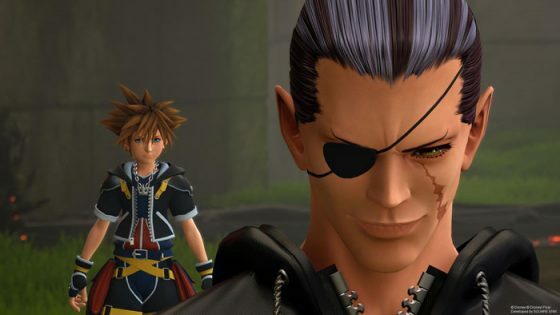 You won’t understand what Ansem the Wise and Ansem have in common—trust us, we barely do—but you’ll at least understand the plight going through most of the past Kingdom Hearts titles. Kingdom Hearts III begins players with a down powered Sora who must rekindle his past memories and powers to hope to stop the various foes before him. That means you can expect Sora not being the super strong Keyblade warrior he was in Kingdom Hearts II or even Kingdom Hearts Dream Drop Distance. Luckily though, Sora won’t be a weakling for long as Kingdom Hearts III constantly gives you new powers and skills that make Sora pretty tough rather quickly. Added to this is the fact that Kingdom Hearts III has learned a lot from its past titles and has implemented a lot of elements into Sora’s latest adventure. In Kingdom Hearts Dream Drop Distance—the partial sequel to Kingdom Hearts II—Sora gained various abilities that allowed him to interact with the environment around him to unleash new powers upon heartless and nobodies. Kingdom Hearts III uses a very similar flow system but enhances it with new skills that allow Sora to call upon more co-op-based attacks from his allies and unleash powerful Disney-inspired rides on his enemies. Case in point Sora can summon a giant ship that teeters back and forth hitting enemies constantly or even utilize teacups that allow him to shoot bullets at enemies. Add this to a smorgasbord of special attacks that correlate to the world Sora’s currently in and you’ll smile as you see dozens of powers Sora has gained in his latest outing. 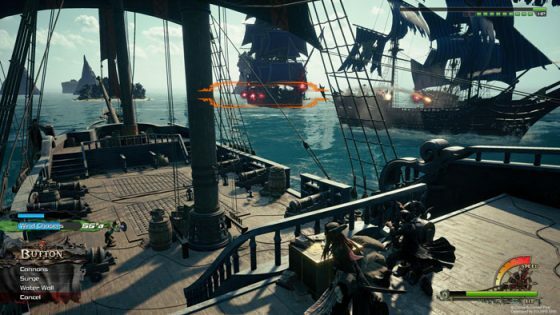 The new weapon system is also something we must mention. Sora can now equip three Keyblades at one time and seamlessly switch between them during combat. You’ll need to use various Keyblades this time around as each allows Sora to enter a “form” that gives off different moves and skill sets. 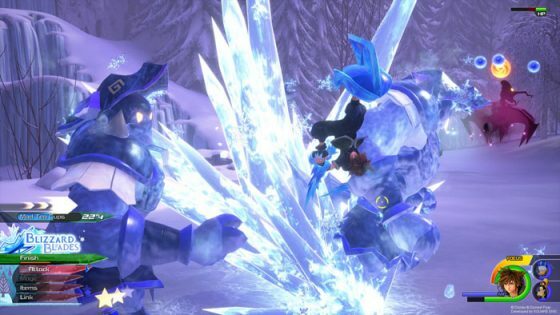 The earlier Keyblade you get from Hercules allows Sora to change his Keyblade into a defensive shield that can be thrown and shoot lighting-based attacks. When in max form—which is obtained by doing damage to enemies—Sora summons a chariot that he rides blasting enemies with constant lightning spells. This new Keyblade system is vastly superior to Kingdom Hearts original and II as it makes new Keyblades not just replace the one you have as you progress. Speaking of the new worlds, Kingdom Hearts III has quite a bit of new—and old—ones to explore. You’ll be revisiting places from past titles but also be seeing some new ones like the world of Frozen, Pirates of the Caribbean and Toy Story to name a few. Each new world offers a plethora of exciting locals to see from their respective movies and you’ll also meet the various characters from them as well. Some worlds fair a bit better than others—we loved Pirates of the Caribbean and Toy Story—while others just miss the mark slightly. Don’t get us wrong, these worlds are still fun to fight in and explore till you find every hidden item and spot to see but compared to past worlds like Tron and The Nightmare Before Christmas, these worlds feel a bit too fantasy based. Outside of fighting heartless and other enemies, you’ll find yourself once more traveling the various worlds via the gummi ship which has gotten quite a big improvement. Players can now freely explore space with markers leading the way to gummi ship battles and new worlds to enter which is both fun and liberating in comparison to the linear gummi ship of the past two main games. Though, we still feel that the gummi ship exploration moments aren’t as exciting as getting on a planet and knocking some heads with Sora’s Keyblade. It’s not a major issue and as we said, the gummi ship exploration is leaps and bounds better than Kingdom Hearts or Kingdom Hearts II, but we just feel it doesn’t do much to really ever feel exciting. Graphically—and sound wise—Kingdom Hearts III is easily the best of the series and one of the best looking Square Enix titles to date. Cutscenes are truly beautiful and even in game moments look top notch. The music and voice acting also does an incredible job of making every moment in Kingdom Hearts III—sad or happy—feel impactful and noteworthy. There were a few sad moments when characters from various Disney films didn’t have a single line of vocal dialogue—Phil from Hercules, for example—but we assume their voice actors were too busy and couldn’t help in time. Lastly, let us wrap up our review to talk about the differences in Xbox One and PS4 versions of Kingdom Hearts III. As mentioned above, we nabbed both versions and we put some time into both of them to scour for differences. 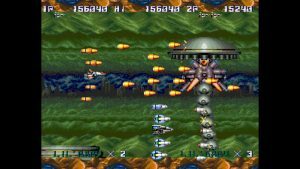 Gameplay wise, both versions are identical with no issues for either system. Visually though, we give PS4 a bit—keyword bit—of an edge. We noticed a sharper and brighter color palette with the PS4 version of Kingdom Hearts III regardless of the TV or monitor we used. Thankfully though, it’s clear that both versions are almost identical and that means owners of either system can enjoy Kingdom Hearts III to its fullest. 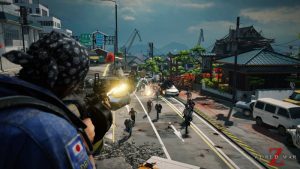 Long awaited games can tend to fall victim to shoddy development or a lack of feeling like the wait for said game was worth it. Luckily, Kingdom Hearts III has none of these problems as it is just a straight up amazing third entry in this already renowned series. The story for Kingdom Hearts III still can be a bit confusing and often feels like it changes elements we’ve seen in previous titles—retconning is done quite a bit in the Kingdom Hearts lore—but Kingdom Hearts III has a truly emotional story behind all of its confusing side elements. Sora, Riku, Kairi and the gang are pushed to deal with various issues left and right in Kingdom Hearts III and watching them overcome trial after trial bought us a constant smile on our faces. Sora’s journey is at a conclusion—from what it seems like—but we don’t believe Kingdom Hearts in general has reached its final entry. That’s a good thing as if they continue to improve on the wonderful gameplay and graphics seen in Kingdom Hearts III then the next entry will be even better than this one! If you’ve been waiting for our verdict on Kingdom Hearts III then wait no longer, folks. We implore you to buy Kingdom Hearts III as soon as possible! Kingdom Hearts III has been a long-awaited title but one that has so far been quite worth the wait. Every hour we put into Kingdom Hearts III was another hour of pure joy and bliss as we visited new worlds and got closer to seeing Sora’s long adventure reach the climax it deserved. 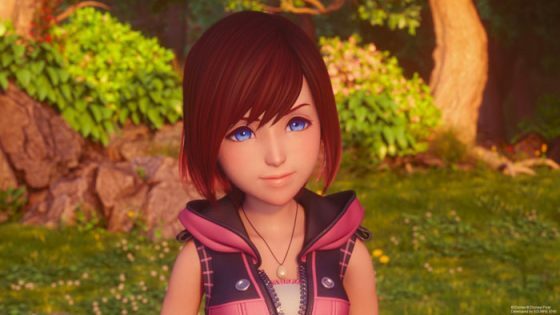 We worried that Kingdom Hearts III was going to make a mistake somewhere and fail in some regard but honestly, there was never a time that we thought it missed a mark. In our minds, Kingdom Hearts III was an amazing game that we hope leaves room for a new journey somewhere down the road. What are your thoughts on Kingdom Hearts III? Are you loving it or do you think the multitude of delays wasn’t worth the end result? Comment below so we can hear from all of our readers out there! 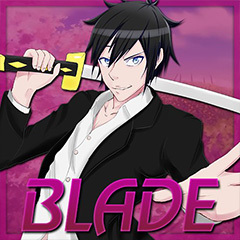 For more reviews of both anime and video game variety, be sure to keep stuck to our hive here at Honey’s Anime.